In the olden days, if you were a very lucky child, you might come home from school to find your mother taking a sheet of freshly-baked cookies out of the oven. Not to quibble with the romantic fantasy, but who were those cookies for? They were for everyone in the family to enjoy, right? Mom was wonderful, of course, but…she was the one who picked the type of cookies she would bake. She was the one who had the fun of baking them. And she probably ate half of those cookies even before the school’s dismissal bell sounded. How much cooler are microwave mug cakes? 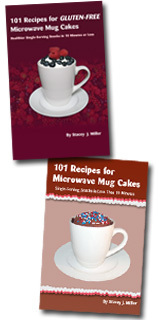 With microwave mug cakes, you choose the flavor. You get to bake it. You get to eat the whole thing, and you don’t have to share with family members — or even with your mom. Which is the real reward for getting through another day of school: mom’s cookies or a microwave mug cake? Your mom owned those baking sheets full of after-school cookies. You own the microwave mug cake, piping hot, on your plate…in less than ten minutes. As far as I’m concerned, there’s just no contest. This entry was posted on Wednesday, September 16th, 2009 at 8:45 am	and is filed under Uncategorized. You can follow any responses to this entry through the RSS 2.0 feed. You can leave a response, or trackback from your own site. Snow…and a freshly-baked microwave mug cake.